Started with a Trek FX 7.4, but sold it and got a 2015 Specialized Sirrus Elite Carbon. Love it so far, but regretting not getting the expert or pro model. Got such a good deal, I can't really complain. Retails for $1,500 and I got it at year end for $970. Got 400 miles on it so far. Just wish I had better wheels and 11 gear sprocket rear instead of 9. Could use a lower gear on some steeper hills, but can always upgrade. Great looking and riding bike. Can't ride under bar road bikes due to neck issues and this bike does the trick. Why were you not satisfied with your 7.4FX? My new Sport Disc, picked it up over the weekend, rode it around yesterday and to work this morning, really nice ride. It's got the plug and play fenders and I added a Topeak Explorer rack. I spray painted the explorer's bracket arms black so they'd match the bike and because I hate how the unpainted metal on that rack looks. Also, I'd read on some Amazon reviews that Topeak's non-disc rack would fit on the sirrus disc and they were 100% correct - the non-disc rack went on without any problems. While I'm at it, I'd like to thank everyone who posts on bikeforums. 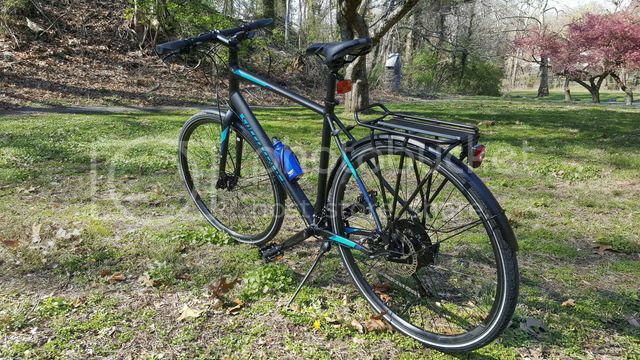 I shopped around for a few months before deciding on this bike and all my gear, and there was so much helpful info here. Especially all the sirrus, hybrid and commuting threads. Keep up the good work, people. Last edited by Clamms; 04-11-16 at 08:14 AM. Nice ride Clamms! Like the look of your Sirrus with fenders and rack. Are the fenders Specialized Plug and Play? Trek FX was a great bike, but started to outgrow it. Friends have full carbon bikes and just couldn't keep up. Getting the Sirrus resulted in a gain of 2 mph average speed with same effort. 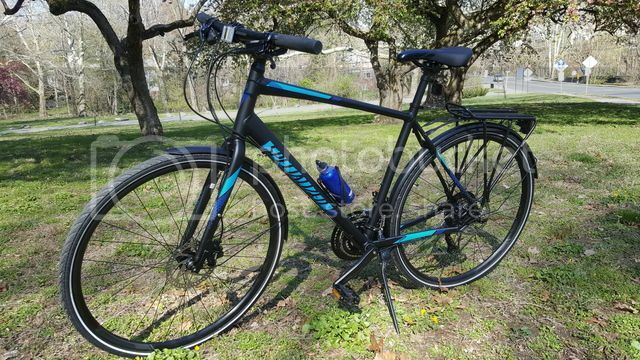 I do charity rides of about 60 miles and needed a higher end bike. Don't like the geometry of road bikes, so had to get a flat bar bike. Are those upgraded wheels? Which model is that? Good looking bike! Thanks! It's the 2016 Sirrus Sport Disc in black, cyan and blue. Stock wheels (stock everything). 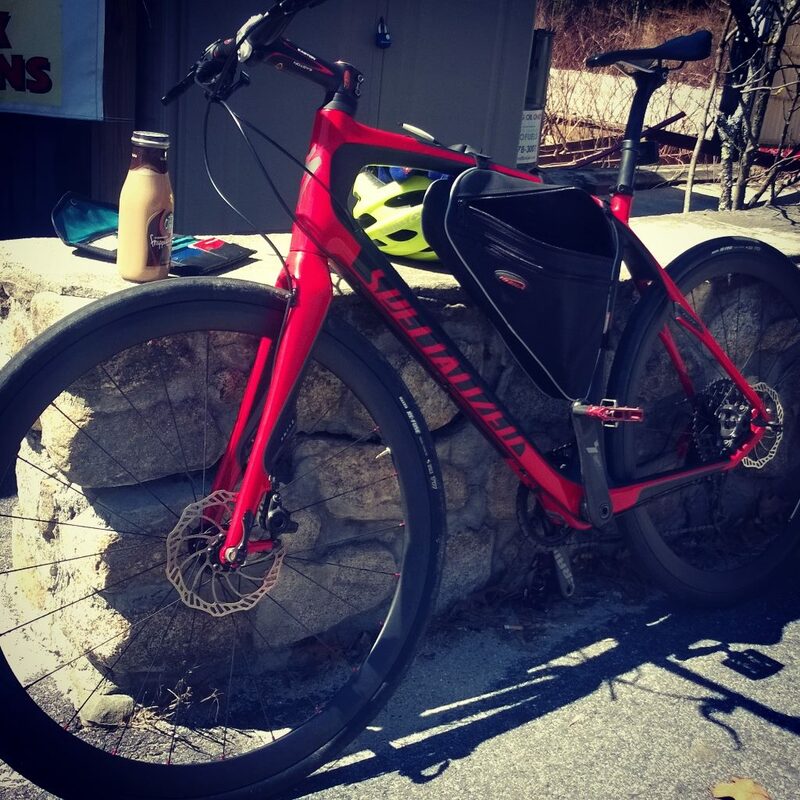 Bikes: 2016 Specialized Sirrus Carbon Comp disk. My new ride. Brought home my new 2016 Carbon Comp Disk last weekend: Love it! Great to move up to Carbon, discs, comfortable reach, all without squeeks, clicks, and rubs. I chose the Comp because it's got the gear ratio I need to get up the hills of Mystic. 34 teeth in the cassette, 32 on the crank yields a ratio of 0.94 (<1) ! Trek FX was a great bike, but started to outgrow it...Getting the Sirrus resulted in a gain of 2 mph average speed with same effort. What, specifically about the Sirrus would you attribute the increase to? You got yourself one fine bike there. This iws my sirrus elite 2015. Buying 5 monts ago and I love it! Stock wheels. They do feel heavy and slow. I see that there are 3 wheel sets in the Sirrus line. Axis Classic, Axis 2 on expert model, and Axis 4 on pro version. Just bought upgraded wheels and tires. Vuelta Corsa Disc lites are on the way. Also got Continental Grand Prix 4000 II S tires. Changing from 30mm wide stock tire to 28mm. Hoping to get greater efficiency, while maintaining comfort. Will submit new photo when completed. Lighter weight. Better setup. Slightly narrower tires. I also had a high stem riser on the trek that put me more upright than on the Sirrus. Just joined the Sirrus club today with the purchase of a 2016 Elite Carbon. It's my first "road" bike. Been pretty heavy into mountain biking and wanted something speedier for my "commuting" (I work from home) than the clunker Townie that I've been riding. Mountain biking has given me an appreciation for high quality componentry, but I was trying to keep the wife happy and stick to a budget so I went with the entry level carbon model knowing full well that I would eventually upgrade all the components just as I have done with every other bike I have owned. Drivetrain will come too, but I'll wait till I have put some miles on and taken most of the life out of this Sora one before I upgrade to something cool like an Ultegra. Just purchase my first bike - 2016 Elite Carbon. Just upgraded wheels and tires from stock 2015 elite carbon. Continental Gran Prix 4000 S II TIRES. Went from 30mm wide on stock to 28's. Good balance of comfort and less rolling resistance. Got Vuelta Corsa Lite aluminum rims. Looks great and noticeable improvement from stock setup. Got a great deal on both! So couldn't pass it up. Money well spent. Congrats! It's a great bike! Hey everyone. Commute daily on a 2016 Sirrus Sport disc and I love it so far. Has anyone replaced their pedals yet? I'm curious as to what you went with! Just ordered a Sirrus Expert Carbon. Should have it by the end of the week/early next week at worst. Looking forward to riding and sharing pics!